Consumers are interested in reading labels while buying snack and bakery products. Along with pocket friendly products, they want indulgent snacks that offer health benefits. As a result, there is untapped potential as far as the small and large companies and local vendors operating in the market for snack and bakery products are concerned. The push for healthy living is the primary factor poised to drive the demand trends for consumers in the U.S. and across the world. Consumers of today prefer nutritional foods to enhance the overall health and wellbeing of their families. More and more Americans want to steer clear of bakery ingredients with hard to pronounce names and moreover, the traditionally familiar products with potentially harmful chemicals as the key ingredients. Therefore, it is vital for bakery and snack vendors to consider these factors while defining their next business strategy. On-the-go. The ‘snacking-on-the-go’ trend is expected to remain unchanged in near future with rising preference for products suitable for eating while commuting. The strong driver for these on-the-go eating and snacking habits among young population is the rising health consciousness. High demand for such products is anticipated to reflect on the changing snack and bakery production trends in the U.S and around the world. For instance, recently the U.S.-based Café Valley introduced its new ring cake products in four new varieties. Gluten-free. Gluten-free products are considered healthier and consumption of such products has become a lifestyle choice rather than a medical need, find researchers. The claim that gluten-free snacks and bakery products are high in fiber content and low in saturated fats, carbs, and calories at the same time they are free from additives. These advantages are poised to bode well for the production of gluten-free goods. For instance, La Panzanella recently introduced its new gluten-free Oat Thins crackers in three distinct flavors. Shopping habits. Consumer of today prefer shopping for bakery products from discount stores, supermarkets, or wholesale sellers. More than taste, they seem focused on health factor, as far as baked goods are concerned. And thirdly, the consumers seem to stress on the quality of bakery products more than the price factor, suggest researchers. This is a vital aspect to keep in mind for the baked goods producers and suppliers. Functional and organic. There is a significant rise in demand for bakery products favoring particular dietary requirements. Along with gluten-free, organic and kosher ingredients are gaining prominence. Safer perception of most functional ingredients can influence the demand for bakery products. This factor is impelling innovation among small and medium business as well as large manufacturers. Mood boosting. Demand for foods to boost the mood is on the rise. Hence, ingredients typically used in food and dietary supplements are making their way into snacks. Along with the ingredients like adaptogens, nootropics, and MCT oil, there is a rising demand for natural ingredients like protein sources, dried fruits, and dark chocolate are gaining prominence. Consumer awareness regarding advantages of such ingredients for energy boosting and stress management is anticipated to impel their demand in the years to come. Clean label. Complex labels with numerous ingredients is ‘bad news,’ as the consumer of today prefer as few ingredients as possible. Consumers today are interested in the label available at the back of the food package and choose products with ingredients they deem safe and healthy for regular usage. Manufacturers need to keep this in mind while using highly refined or chemicals in albeit familiar ingredients because they consumers are likely to reject them and look for simpler options, suggest researchers. Fruit- and vegetable-based snacks. As per the Centers for Disease Control and Prevention’s (CDC) Morbidity and Mortality Weekly Report (MMWR), only 1 in 10 adults meet the federal recommendations for fruit and vegetable consumption. However, rising demand for snacks made using real fruits and vegetables is on the rise. Products like fruit snacks, veggie chips, and meat snacks are gaining popularity among consumers. Some of the prominent products include Rhythm Superfoods Vegetable Chips, Peeled Snacks, Trader Joe’s Broccoli Bites, and KIND Fruit Bites and Fruit Bars. Ethnic flavors. In the era of globalization, bakery and snack producers are focused on capitalize on ingredients and products available across different parts of the world for authenticity and unique ethnic flavor. For instance high fiber and nutrient dense products such as subtropical fruits like jackfruit, peanut flour from Middle East, and mainstays from Latin American countries like Peru and Brazil are now used in preparing healthy snacks. Some such products available in the market include Inka Corn Nuts, P-Nuff baked peanut puffs, Mavuno Harvest Dried Jackfruit, and so on. The scope and variety of snacks and bakery products continues to evolve across the U.S. To cater to the evolving consumer choices, bakeries and snack producers are forming business collaborations with restaurant operators and other small and large businesses in the market. The market players have understood the importance of creating menus based on consumer preference and dietary requirements. As per the experts, the market for snacks and baked foods is expected to witness steady rise owing to high demand for healthy and nutritious foods, especially between the meals. Emerging trends. The rising popularity of trans-fat free, multi-grain, and whole grain products will bode well for the bakery products. 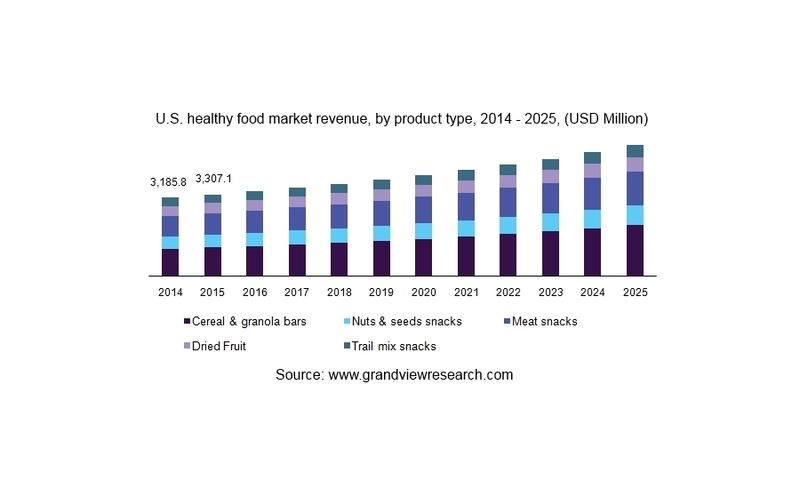 On the other hand, fast paced lifestyle, high awareness regarding importance of healthy eating, and availability of numerous snacking options will work in the favor of snacks market. Emerging food trends are anticipated to create business opportunities for the leading as well as new entrants operating in the market. For instance, the recent trend of low- fermentable oligo-di, mono-saccharides and polyols (low-FODMAP) diet is expected to compete with the existing trends such as gluten-free and paleo diets. Portable protein. Demand for protein-rich foods is expected to remain high in the years to come. Along with baked bars and nutrient-filled snacks made using plant and meat based products will witness steady rise in demand. Protein sources like wheat germ, insect protein, pea protein, sprouted grain, nut butters, and other options offering fiber content will also register impressive growth. No sugar, no preservatives. Consumers are ready to pay more for the foods free from cholesterol, preservatives, soy, and genetically modified organisms (GMOs). 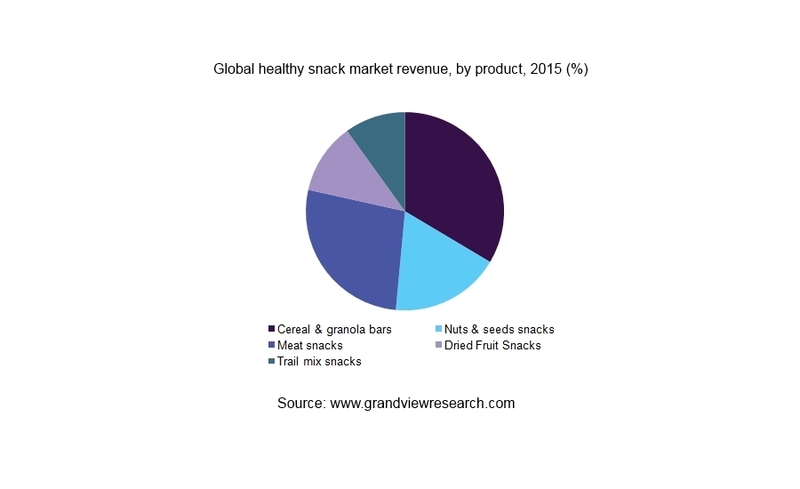 There is rising demand for low sodium and low far snacks and bakery products. The traditional objection for high sugar and sugar substitute loaded products is anticipated to remain so. Despite innovations like natural sweeteners, consumers are likely to prefer savory snacks and savory flavored desserts made using natural blends of seasonings and herbs than sugary options. Pulses, seeds and beans. The relevance of seeds, pulses, and beans is expected to get highlighted even more with rising preference for vegan and vegetarian snacking options. Consumers seem to be on the lookout for tasty and natural protein alternatives they can find at pocket-friendly prices. Hence, researchers expect a surge in production of snacks and baked goods like biscuits and cakes made using these sources in near future. In conclusion, the snacks and bakery product manufacturers have an open field as far as the opportunities are concerned. The opportunities in the market are driven by innovation, transparency, and simple food products suitable for consumer taste buds and pockets.